Having recently seen a couple of posts on LinkedIn where people have expressed their confusion over what is and isn’t allowed when it comes to running competitions on social media, I thought it would be useful to provide a “Do’s and Don’ts” guide. Of course, competitions are a great way to create a buzz around your brand, engaging current customers, attracting new customers and capturing data. Having said this, Facebook and Instagram aren’t the best places to run contests, particularly as they have very specific rules about what is and isn’t allowed. The reason the platforms are getting tougher on this, is to clamp down on ‘engagement baiting’, in order to increase the quality of the content on user’s news feeds. This should mean the end of ‘like and share to enter’ posts. It’s interesting to note that there are a number of brands, both high-profile and small, who seem to be ignoring Facebook’s warning. But is this deliberate, or are they in fact blissfully unaware of Facebook’s rules around competitions? 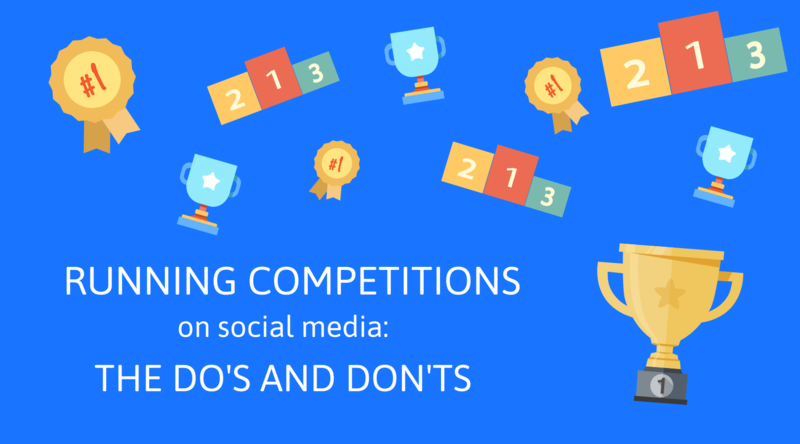 If you still want to run competitions on your social media channels, consider alternative methods such as running the competition on your website, and promoting it on social media. This will result in more traffic to your site, where you can potentially get entrants to explore more and even go on to make a purchase, and mean that you’re unlikely to be breaking any rules around engagement baiting. However, it’s also important to keep a number of helpful tips in mind when running a social media competition. Promotions on Facebook typically include entries or registrations, a giveaway or a prize being offered, and there being an element of chance involved. Be clear on what Facebook forbids! Force an entrant to share your contest on their timeline. Make the entrant share on a friend’s timeline in order to gain additional entries. Make an entrant ‘tag’ themselves or a friend to enter – this is common place on Facebook and Instagram, but do not fall into the trap! Of course, there is nothing stopping users from sharing your post or tagging their friends in it, but this should be because your content is engaging and attractive enough to them, and by no means should it be a necessity to enter the contest. Facebook sees competitions in a number of different ways, including sweepstakes & giveaways, contests and lotteries. Giveaways are defined as a way in which a person can win a prize based on chance. They do not have to make a purchase to be in with a chance of winning. Contests are regarded as a campaign in which effort, skill or merit is required to enter to win a prize. For example, a brand may ask a user to post a picture or video of them with a particular product, which is classed as an entry. Winners are usually chosen at random, but can also be judged or by public vote. Finally, lotteries are best avoided, as they fall under the gambling remit. A lottery requires an entrant to purchase an entry, and can be illegal in some countries, for example the US. As with any competition, it is vital that the terms and conditions of entry are made clear. Typically, they will include things like “no purchase necessary”, as well as details of any restrictions, details on how to enter, and the details of how to contacts the company running the promotion. Finally, it is best practice to make it clear within your rules and regulations that it is in no way associated with the platform, and that it is not sponsored, endorsed or administered by it. This post isn’t about putting you off running competitions on your social media channels; as we’ve mentioned before, they can generate considerable interest in your brand, which can only be a good thing. In fact, it’s about providing you with the information you need to ensure that you’re playing by the rules. With these tips, as well as careful planning around your campaign goals, target audience, and how the competition is going to run, you should be able to create an engaging and fun social media campaign, which also sticks to the rules!